The 1980s was the decade when black people in the UK started to make their mark in British institutions and political life. We saw black men and women entering politics and local government, education, housing, the justice system and so on. Mrs Lydia Emelda Simmons was one of these pioneering figures from the 1980s. 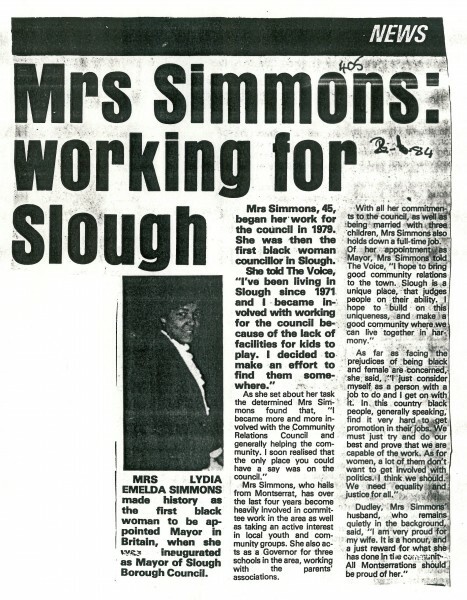 This cutting from the Voice in 1984 shows Mrs Simmons, who made history by becoming the first black woman to be appointed mayor in Britain when she was inaugurated as Mayor of Slough Borough Council. Mrs Simmons, who was born in Montserrat, had a full time job and a family. She said that one of the main reasons for becoming involved in politics was because of the lack of facilities for young people in the community, and “I realised that the only place you could have a say was on the council”. I shall be highlighting more of these 1980s pioneering figures in future blogs. Black Firsts Blog: Whatever happened to Cory Roberts? 1 Comment on Black Firsts Blog: Whatever happened to Cory Roberts? 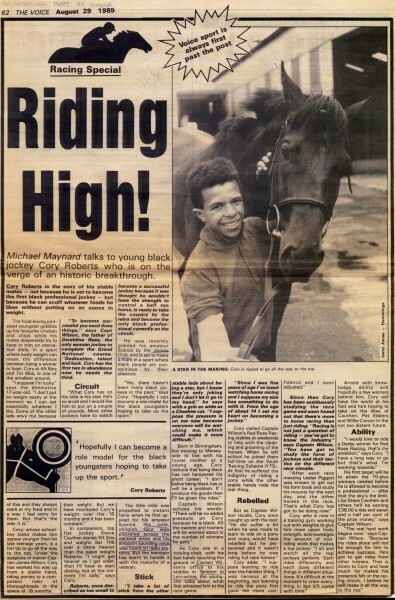 When I came across this story of Cory Roberts (printed in The Voice, August 28, 1989) – the young lad with the friendly face, who was on the verge of becoming the first professional black jockey – I was well pleased because I was keen to find black firsts from as wide a variety of occupations as possible. So I thought here is one sport where the presence of black people is certainly not conspicuous, he’ll make a good role model. Today, however, I have been searching for Cory but can find no trace of him. Cory Roberts, 17, “the food-loving pint-sized youngster” as he was described by his colleagues, who never puts on weight, was 4″ 8″ tall, and 7 stones 8 pounds in weight, an ideal size for a jockey. He worked his way up from a table hand riding ponies to a competent rider of thoroughbreds in the space of 18 months, according to the article. Cory was born in Birmingham but moved to Merseyside to live with his foster mother at a young age. From the age of 14 he had set his heart on becoming a jockey. When he left school he went on a Youth Training Scheme (YTS) at a local stable. His ambition, he said, was to ride a Derby winner. Back then he was ready to take on the country by the reins and become the only black professional currently on the circuit. And an afterthought: I noticed that the photographer’s byline was for Leroy Jones-Hemmings. Come forth Leroy!